The two-dimensional (2D) crystal film of streptavidin (SA) prepared at the air/water interface had been transferred onto a hydrophobic surface of silicon wafer and studied by atomic force microscopy1). In the present study the deposition of this film onto glass coverslip has been examined. Annealing the glass coverslip at 525 ºC rendered the surface smoother and stabilized adhesion of the transferred film. The use of glass as substrate for protein immobilization has the advantage that an optical microscope can be used in transmission mode, and the fluorescence quenching which generally occurs for dyes locating near metal or semiconductor surfaces can be avoided2）. 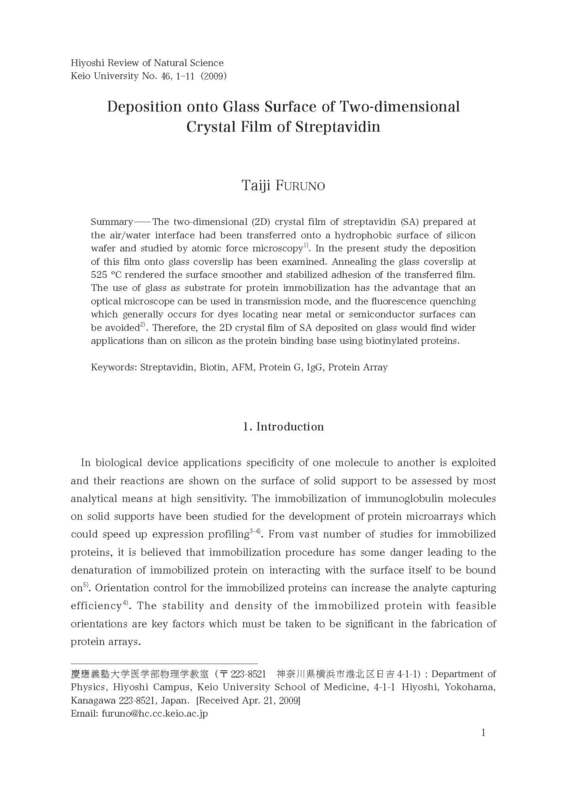 Therefore, the 2D crystal film of SA deposited on glass would find wider applications than on silicon as the protein binding base using biotinylated proteins.